This was definitely my favourite of the trilogy. Angelica was the most interesting of the sisters and therefore the plot was the most interesting. I really enjoyed her knowing her one true love on sight and going after him with purpose. The romance in this book was also the best of the three. It was a relief to finally work out the true motive behind all the kidnappings. Although pleased to finally learn why Mirabelle wanted to hurt the Cynsters, I thought her supposed motivation was a bit weak and unrealistic. 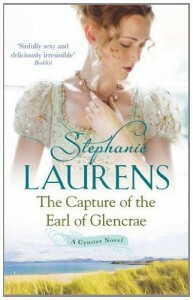 Stephanie Laurens is always a safe bet.